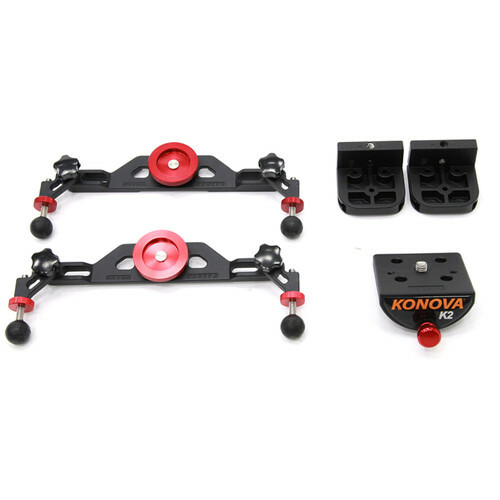 This K3 Slider Upgrade Kit from Konova includes the necessary components to update your older K3080 slider to a newer K3B2 model. It includes new rail blocks for the ends of the slider, an updated camera support platform, and a pair of redesigned legs. The legs are angle adjustable and feature height-adjustable rubber ball feet. For secure and tool-free attachment to the new end blocks, the legs have a 1/4"-20 thumbscrew and feature two guide pins to keep them stable and firmly in place. Additionally, the updated end blocks and camera platform make your K3080 slider compatible with Konova's Crank Handle and Motorized add-on kits, letting you create smooth and precise manual or motorized camera moves. Box Dimensions (LxWxH) 15.7 x 12.1 x 3.7"
K3 Slider Update Kit is rated 3.0 out of 5 by 1. Rated 3 out of 5 by Anonymous from Great quality But . . . Nothing wrong with the quality of the kit, but I wish they sold the parts separately. I broke one of the legs on accident. I tried to contact Konova several times with no reply. I needed to use the slider for a job so I had no choice but to spend the $$on the upgrade kit.